Firing its latest salvos at Apple, Amazon, and Microsoft, Google on Tuesday announced several new devices, led by its Pixel 3 and 3 XL Android smartphones. The phones have 5.5- and 6.3-inch edge-to-edge displays, with Qualcomm Snapdragon 845 processors, 4 gigabytes of RAM, Bluetooth 5.0, and front-facing stereo speakers. The devices continue to use single-lens, 12.2-megapixel rear-facing cameras, but there are two lenses on the front, the second offering an ultra-wide field of view. Google has also upgraded the Pixel line with wireless charging up to 10 watts, and is selling an optional Pixel Stand to match. The latter triggers a custom interface during docking -- for instance making it act like a Smart Display/Google Home, and gradually adjusting lighting for wake-up alarms. The phones run Android 9 Pie, but have a unique feature enabling Google Assistant to screen telemarketing calls with options to block or reply. The Pixel 3 and 3 XL, shipping Oct. 18, start at $799 and $899 for 64-gigabyte models. Upgrading to 128 gigabytes costs an extra $100. Verizon is the only third-party carrier offering the phone directly (and running a buy one, get one deal already), but Google is selling the phone unlocked, including through its Project Fi wireless service. Another product revealed today was the Home Hub, Google's first self-made product based on its Smart Display platform. The product is similar to the JBL Link View or Lenovo Smart Display, but deliberately omits a camera, avoiding some privacy concerns. One new feature is Home View, a swipe-down dashboard for quicker control of smarthome accessories. Another is Live Albums, an option for Google Photos wallpaper which can automatically add images with specific people in them. Machine learning is used to discard blurry photos or images of objects like receipts. The Home Hub has a 7-inch LCD and Bluetooth 5.0, and is being sold in aqua, pink, white, and charcoal colors. It ships Oct. 22 for $149. Finally the company previewed the Pixel Slate, a Chrome OS tablet with an optional stylus and keyboard cover, similar to Microsoft's Surface line. It has stereo speakers, 8-megapixel cameras, and a 12.3-inch display. While the base $599 configuration uses an Intel Celeron processor, the $1,599 top-end system has a Core i7 chip, 16 gigabytes of RAM, and 256 gigabytes of storage. I don’t care for the Pixel 3 hardware at all. But I sure wish we had a fully integrated Google Assistant and Google photo’s AI on the iPhone. Uhm. Is it just me, or is “edge-to-edge” increasingly asking for a new definition of the term “edge”? The only item of the three that I had originally had any interest in myself was the Home Hub, and that was for the kitchen. I had made plans to purchase it as soon as preorders opened. With some patience and more than a little luck I was able to pick up an almost unused 2017 Pixelbook for under $450 recently (most of them are still going for over $600 used, at least $800 "new/other"). Flipped into tent mode it's works great for my wife's kitchen recipe uses and serving up some background music at the same time. We're more than happy with last years Pixelbook: great display, good viewing angles and touchpad, best mobile keyboard I've had the pleasure of using, Google Assistant and voice search is great (of course), excellent touchscreen response and fast boot and operation. Absolutely stable on the counter. No need anymore for a standalone smart display in our case. Happy to wait until 2019 when the first truly in-house designed Pixel phones will be released. Until then I've grown pretty fond of my gently used OG Pixel (which surprised me) purchased a few months ago and see no reason at all to replace it yet. If I find a need for another new phone this year tho the iPhone XR will get serious consideration. It looks like a good value. This years Pixel crop is meh IMHO. The phones are what we expected. The Pixel Slate is DOA. At those prices and without any software to run, why would anyone waste money on one? An iPad Pro is a far superior device. No software? Ummm, yeah, you might expand on that. But i'd agree with you that a basic $400 iPad probably does everything of importance that a $600 Slate does. Although I've been wanting Apple to allow all their iPads to act as a home hub. I mean there's at least 100 million iPads going unused because the owners have a newer model. Just make a HomeOS or something that can be downloaded to old iPads. DOA? I hope Apple announces new iPads to put the nail in the coffin on these iPad knockoffs. "Although I've been wanting Apple to allow all their iPads to act as a home hub. I mean there's at least 100 million iPads going unused because the owners have a newer model. Just make a HomeOS or something that can be downloaded to old iPads." Although "old iPads" is somewhat subjective. Seems like you need an iPad Air or newer to do this as it requires "the latest version of iOS" and I believe the iPad Air is the oldest model to support iOS12... but yeah, I'd consider a nearly six year old model to be "old." Funny how I don’t see any tech press (especially The Verge) complaining about bezels. They never do with Microsoft hardware either. And very little squaking about pricing either. If The Verge weren’t Google fanboys they’d have pieces up about how this was a boring, incremental update and these prices are too expensive. Yes, I’ll expand. No software outside of lightweight stuff. Need to do any real work? Not gonna happen. There’s far more powerful software for an iPad than there is for a Chromebook. And tablet optimized software for Chrome (or Android) is scarce. I've not had any issue with non-critical photo retouching, Microsoft Office stuff, writing, etc. What have you tried to do on a Chromebook that you couldn't, but regularly do on on an iPad? Serious question. Maybe you do need some specialized piece of software that there's no substitute for, but I would say that's not common. Those are the biggies it seems are generally needed for "real work"
You just noticed? That's been all over the blogs for weeks now. Those are all web apps I assume, requiring a wifi or cellular connection. Limiting for a tablet, wouldn't you agree, but I might be wrong about that? All of my apps for my iPad Pro run natively without any wifi or cellular connection, which matches my expectations for field use. I have a number of photography and creative apps that utilize the Pencil, and next year, "full" Photoshop and Lightroom, again native. I'd list them, but what's the point. You should just watch the upcoming event when Apple launches the new iPad Pro's. There is always a couple of halo apps that push the performance limit, as an example, utilizing Metal 2. No they aren't web apps. They're all available from Google Play. There are a lot of web apps too for Chromebooks that do not require a persistent wi-fi or cellular connection. That's been true for several years. You should do a search for articles about Mac and Windows users experiences with moving to Chromebooks and especially Pixelbooks for "real work". It will tell you more than I can. Wait a minute,... people go off on thinking Apple charges to much for the extra RAM. Yet Google is charging $100 to go from 64 Gigs to 128 Gig's? Yet Apple is Charging $100 to go from 64 Gig's to 256 Gig's. Plus Apple has a 3rd option for $100 more to go to 512 Gig's. Did you see the Interface for Android for these no home Button phones? It's a flat out copy of how Apple did it for iOS. There's a white line on the bottom of the screen. You can do the SAME swipe up and hold and flip through your apps just like on iOS. Google has become as bad as Samesung in Copying Apple. That Notch on their XL phone is HUGE. Lots of wasted space. They could have 2 lines of Info be displayed, and the same old CHIN on the bottom of the phone like everyone else. 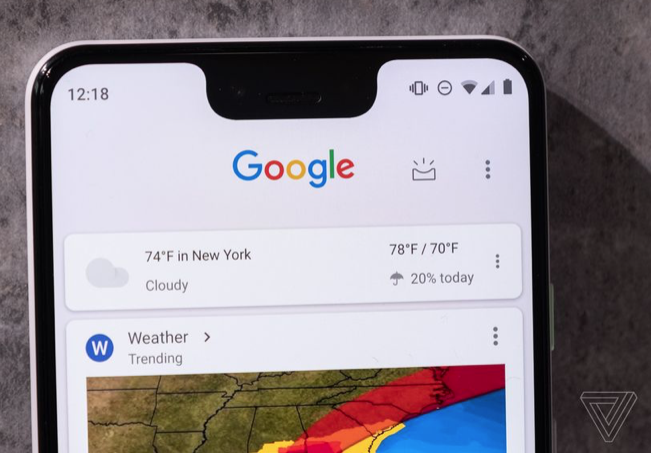 Google should have just had the Top Bezel on the larger phone like on the smaller phone. it would look more uniform. But hey,. at least they're throwing in some USB-C headphones this time around unlike their past phones. I have "a number" of professional graphic applications on my iPad Pro, all native, yet the only one the i can find for Chrome OS that doesn't require a "persistent" connection is Polarr. Your fallback is Android OS apps, but why have a Chromebook if you could just buy an Android Tablet? What's the advantage of a Chrome book or other Chrome device over an Android OS Tablet? I think that few would consider Chrome OS if mobility was a factor. Did you see the Interface for Android for these no home Button phones? It's a flat out copy of how Apple did it for iOS. That's where they should have copied Apple better. What’s funny is Chrome OS uses the same type of Web based apps that were used by the first IPhone and Apple got flack for not having native apps.